Primary Industries Minister Daya Gamage admitted that a firm connected with his Daya Group of companies had won contracts for two road rehabilitation projects costing the taxpayer Rs. 3.6 billion but said it was wholly under his son. However, a search conducted by the Sunday Times at the Registrar of Companies on Friday revealed that he had changed the name of Daya Construction (Pvt.) Ltd. into Olympus Construction (Pvt.) Ltd on January 6 2014. He named his son Chamindra Killittwa Gamage as the new chairman. Earlier, Minister Gamage, who was well known for bankrolling the United National Party (UNP) and had his Pelawatte Sugar Mills in Moneragala taken over by the previous Government under a notorious underperforming assets law, had been the Chairman of Daya Construction (Pvt) Ltd. Among the directors was his wife Anoma Gamage, who is now Deputy Minister of Petroleum Resources Development. Olympus Construction (Pvt.) Ltd., the Sunday Times found, had shareholding in the parent Daya Group of Companies where Mr. Gamage held ownership. He said the ministers had approved 18 projects by 18 different contractors. “It is a formality that these projects come for approval of the ministers. I came to know that one of my son’s projects came up for approval. When I learnt of it, I left the meeting,” Minister Gamage said. No sooner the contents of the Sunday Times report circulated, one Cabinet Minister telephoned the News Desk last Tuesday. He said the report should have been published with the name of the minister concerned. “People are accusing me,” he complained. The issue was raised in Parliament on Friday by Janatha Vimukthi Peramuna (JVP) leader Anura Kumara Dissanayake. Highways Minister Lakshman Kiriella replied that there was no minister involved in the deal. The Sunday Times account last week stated that though the company had been under the minister’s name, since it began bidding for projects under the Government, the name has been changed and overall management placed with a member of his family. Lycamobile operated by Sri Lankan Dinesh Alirajah uses a complex web of offshore and UK companies so opaque that its own auditors cannot account for £134m of assets, according to a recent report in Britain’s Guardian newspaper. The financial affairs of the international telephone calls firm were described as “deeply worrying” by experts who also raised questions about the effect of the firm’s arcane structure on its UK tax bill. The shadow chancellor, John McDonnell, said: “If this is true, then it’s time the Tories finally took this issue seriously and refused to take further donations from any company that has funnelled money via tax havens. “The Tories can’t keep getting embroiled in tax avoidance scandals and not raise a finger. Accounts filed by Lycamobile at Companies House reveal that auditors KPMG warned that its staff “have not obtained all the information and explanations that we consider necessary for the purposes of the audit”. KPMG highlighted £134m owed to Lycamobile by related companies, “for which the audit evidence available to us was limited because of the complex nature of the related party structure the company operates within”. The big four accounting firm, which has signed off Lycamobile’s accounts since its rival EY resigned in 2014, added that it was “unable to determine whether adequate accounting records have been kept”. Tax experts said the lack of clarity around Lycamobile’s accounts, filed six months later than they were originally due, showed the risks presented by complex multinational corporate infrastructure. Alex Cobham, director of research at the Tax Justice Network, said KPMG’s warning was deeply worrying and pointed to “an absence of internal record keeping that beggars belief”. Richard Murphy, director of tax research and a professor of practice in international political economy at City University, said the accounts showed the “danger of offshore secrecy”. And he warned that the lack of clarity over the £134m made it hard to assess whether Lycamobile can pay its debts, which include £3.6m due to HMRC, £7.5m in advances from customers and nearly £18m owed to other businesses. “Let’s not pretend offshore secrecy and complexity has no consequence here in the UK. It also emerged that Lycamobile’s UK operation bought £81m worth of mobile phone airtime last year from Lycatelcom LDA, a company based in the low tax jurisdiction of Madeira. The latest available data for this Portuguese division show it had just four employees, despite reporting £433m of turnover. The Cabinet of Ministers on Tuesday decided to further probe the multibillion rupee Defence Complex which is described as Sri Lanka’s Pentagon. This was after a consultancy firm that dealt with the Akuregoda project was suspended for having charged Rs. 600 million which official Government Spokesperson Rajitha Senaratne said was far in excess. He told a media briefing that the move to suspend the firm’s contract followed the recommendations of a four-member committee of officials. At Tuesday’s ministerial meeting, President Maithripala Sirisena, in a cabinet memorandum recommended that the same four-member committee be called upon to further probe two different aspects of the project. The second aspect is the total consultancy cost. This cost, it has been pointed out by the four member Committee in its report, are limited to 5.5 percent. Of this percentage, 1.5 percent or Rs 606.03 million has been allocated to the consultancy firm and four percent or Rs 1,556.90 million to the Central Engineering Consultancy Board (CECB). President Sirisena told ministers that “the computation of total cost estimate should be re-done based on accepted norms and by competent persons. Consultancy fees should be determined accordingly and if any overpayments or under payments had been made, such payment should be appropriately adjusted. Furthermore, consultancy fees should be as per the Cabinet decision i.e. payment based on work-done instead on a man month basis. The four member-committee is chaired by G.S. Withanage, Secretary to the Ministry of Foreign Employment and includes H.M. Ajith Chandra, Director, Office of National Unity and Reconciliation, S.D.H. de Silva, Director of the Ministry of Housing and Construction and P.B.S.C. Nonis, Director of the Department of Public Finance. Former President Mahinda Rajapaksa returned to Sri Lanka last Tuesday after a ten-day visit to Japan. 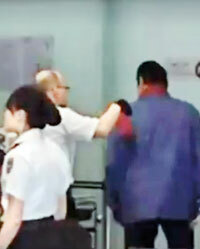 At Terminal Two of the Narita International Airport in Tokyo, a security guard is seen using a hand held metal defector over his jacket. The Ministry of Foreign Affairs turned down a request from the former President for protocol assistance and other courtesies during this private visit. He was given the same facilities accorded to an MP. While a former President was being bodily frisked, even foreign officials are welcomed at the Colombo Airport with garlands and dancers. Even then Prime Minister, Ratnasiri Wickremenayake was stopped at an entry point in Japan when he went there to attend a religious ceremony. Villagers living in an idyllic southern island, bound by the sea and a river, are puzzled by the nightly practice – a powerful searchlight being focused on trees where hordes of birds of different species rest. The result is cries by the frightened birds and even crows as they take wing in clusters to different areas. Those behind the exercise began to be exposed only after a visitor from Colombo saw what was going on. A prominent businessman and his new close buddy, a high flyer, are behind this ‘anti-environmental’ operation. The reason – the duo want to put up a luxury tourist hotel in the area. Shooing the birds away, they believe, will deprive the environmentalists a slogan that it was a bird’s paradise. Now, the Police in the area have been told to keep a close eye and report the goings on.